One of our loyal customers accomplished a very impressive race this May. Amanda Eitzen traveled out west to the inaugural Grand Canyon Half Marathon. The course began at the north end of Tusayan, AZ right outside the South Rim of the Grand Canyon. We interviewed Amanda to hear about her experience at this new race. Did you actually get to run in the Grand Canyon? 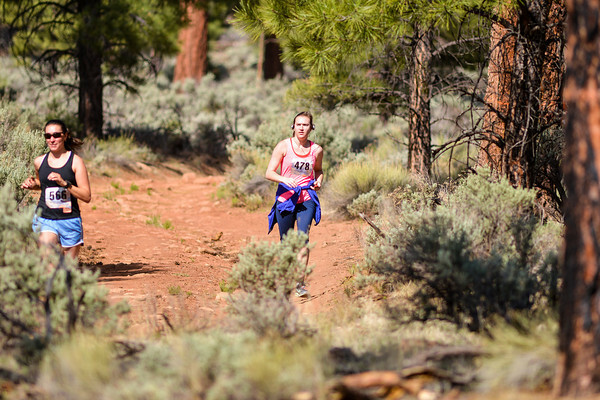 The race took place just outside of Grand Canyon National Park in the nearest town; Tusayan. I spent a couple of days in the park after the race and hiked part of the canyon. Was this half more of a road race or a trail run? This race was almost completely trail. The last mile was the only part of the race that was pavement. How did you train for the elevation changes on the course? I made a point during training runs to push myself harder than usual to get my heart and lungs prepared for the overall elevation change (which is over a 6000 ft difference from Hoboken’s elevation.) For the hills along the course, I would often run the hills of Stevens’ campus and the “Stevens Stairs” that join Sinatra Drive and 6th Street. What was the most challenging part of this course? The most challenging part of the course was between miles 10 and 12 where the path was mainly uphill and scattered with large rocks. I passed many racers who took a break to walk this part of the course. Another challenge was staying hydrated in the dry desert heat. The Hydrapouches we used for water only held 6oz at once and the filling stations were 2 miles apart. What were the views like on the course? The course was woody in some parts, but very open in other parts. My favorite was running through the more wooded areas because it reminded me more of home. Unfortunately we were not close enough to the actual canyon to see the sites in the park. What was your favorite part of the race? It might be cliché, but my favorite part was the final sprint into the race finish. The announcer called my name and where I was from, and I felt that I was representing New Jersey as well as myself. It sounds like there is not really room for much spectator support. How did you keep yourself motivated? That is true - the race spectators were gathered at the end since it was a trail race. However, I think my music kept me going the most. When I felt very tired or hot I would flip to a favorite song of mine, and then I’d actually smile and feel inspired to keep going strong. I have been a musician most of my life, and I probably would have never begun to run without music in my ears. This was an inaugural race, how did it compare with other races that you have done? I certainly have a sense of pride being a part of this inaugural race, and I think it was also inspiration to try and set records not only for ourselves but for future racers. I ran with my aunt and her two friends, and at 40 years old, my aunt’s friend Lyn was participating in her first half-marathon (and longest race to date). Without any expectations, she finished FIRST in her age group, and therefore set a record and a precedent for other women her age to follow. I thought that was very cool. Any tips for someone who would like to run it next year? #1 Stay VERY well hydrated. The dry heat is no joke.